To everyone in the Northern Hemisphere: Happy Spring & Shedding Season! Public Service Announcement: Don’t wear fleece for the next 2 months. Sorry the blog has been so quiet – 2 young kids and multiple colds and rough nights really cuts out free time. However, there are some links I’ve been wanting to share with you lately, so here we go! ~ Have you been following the Special Olympics World Games in Abu Dhabi? Humans of New York has been doing a really neat series featuring athletes’ stories and how life changing participating in Special Olympics can be. ESPN has also been covering the games and has some great videos. ~ This blog review equestrian books! ~ I like the concept of “Identify your pacesetter” from Gretchen Rubin’s podcast Episode 191. As in, something or someone you look to to set the standard or be like. For this blog, it’s definitely Design Mom (her layout, voice, and “A Few Things”) and Hope Engaged (my good college friend, who writes so friendly and donates 100% of her blog proceeds). Who is the pacesetter for your program? For your instructing? ~ Thanks to so many book sales last year (2018, reminder: $4 per book is donated) I was able to donate $1510 to the EQUUS foundation’s PATH Intl. Champion of Equine Service Certification Scholarship! 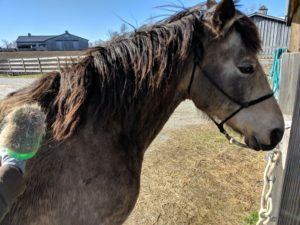 I am so excited that in light of this donation EQUUS was able to offer a second scholarship – usually they offer just one, now they can offer two! Hooray! The scholarship is “to assist prospective instructors with the cost of obtaining the PATH Intl. Registered Level Instructor Certification” and they inform me they will continue to make adjustments to the scholarship as PATH Intl. is rolls out the new certification process.